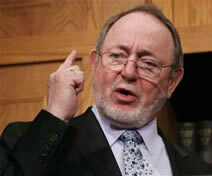 Anchorage, Alaska - Alaska congressman Don Young is caught up in another sleazy deal. This time he took over $20,000 in campaign contributions from indicted Wisconsin executive Dennis Troha, his family members, and company executives just after Young inserted an item in the 2005 federal highways bill that helped JHT holdings owned by Troha. The Alaska Democratic Party issued this press release: Congressman Don Young should explain his role championing passage of controversial trucking legislation that will make our highways less safe, and the campaign contributions he accepted from trucking interests promoting that legislation, Alaska Democratic Party Chair Jake Metcalfe said today. An amendment sponsored by Young allowed 97-foot multi-truck combinations on the highways; it was included in a highway spending bill that became law in August 2005, at the time Young chaired the House Transportation Committee. The change to truck hauling regulations is scheduled to go into effect this week. Campaign records show that Young received $25,000 from the Troha clan and associates, with most of those dollars coming on May 23, 2005, the Journal Sentinel reported. The Milwaukee Journal Sentinel reported that the amendment Young sponsored permitted drivers moving trucks from manufacturers' factories to haul four semitrailer truck cabs at once instead of three, and increased the maximum length that could be hauled in one load to 97 feet. Before that, states were allowed to impose 75-foot maximum lengths. Many truckers opposed the change, saying so-called "four-ways" can be hard to handle, making them unsafe for drivers and other motorists. The legislation was a financial boon to JHT Holdings, a trucking conglomerate whose subsidiaries have a near-monopoly on this business. JHT paid Troha's consulting firm more than $107,000 a month after the law took effect, and had a deal to pay him through 2010 because Congress passed the legislation helping JHT, the Journal Sentinel reported. "Don Young owes Alaskans an explanation," Metcalfe said. "Why did he push a law that compromises highway safety? Why did he take campaign contributions from the trucking interests who benefited from that change?" Troha was indicted this month on charges in a separate case that he circumvented campaign contribution limits by funneling donations through his children, and then lied about it to investigators. Troha pleaded not guilty. Young's office declined to comment despite repeated attempts from AlaskaReport.com.